license, the Church denied the application due to Rizal's excommunication. The Philippine Revolution broke out in 1896. Rizal denounced the violence and received permission to travel to Cuba to tend to yellow fever victims. 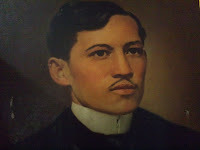 On the way, the Spanish arrested him, then took Rizal to Barcelona then Manila for trial. 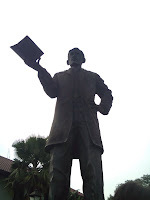 Tried by court martial, Rizal was charged with conspiracy, sedition, and rebellion. Although there was a lack of evidence, Rizal was given the death sentence. Rizal was allowed to marry Josephine two hours before his execution by a firing squad on December 30, 1896. He was 35 years old. Rizal's last literary work was a poem entitled Mi Ultimo Adios ("My Last Goodbye"). Spurred on by the death of Rizal, the Revolution continued until 1898, and with the help of the United States, the Philippines defeated the Spanish and declared independence from Spain on June 12, 1898, creating the first democratic republic in Asia.